You will learn to prep the clay via wedging. Then you will learn slab building technique and will create a rectangular box with a top and handle. 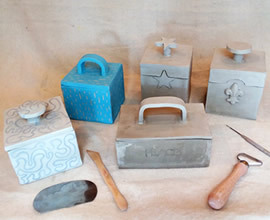 Stamping and other decoration methods will be demonstrated and you can use the techniques on your box as desired. The teacher will then bisque and glaze fire your piece for you. You can buy Cone 5 glaze from the store or select one from instructor's samples. Level: Any and all levels. No Experience Required!